A newspaper is a printed periodical whose purpose is to deliver news and other information in an up-to-date, factual manner. Newspapers appear most commonly in daily editions, but may also be issued twice a day or weekly. While the content of a newspaper varies, it generally consists of a predetermined combination of news, opinion, and advertising. The editorial section is written by reporters and other journalists at the direction of editors and may also be compiled from wire service reports. The advertising content of a newspaper can be divided into two parts, classified and display. Classified ads are small, text-only items obtained via telephone and set into the format by the classified advertising representative. Display ads are obtained by sales representatives employed by the newspaper who actively solicit local businesses for this larger, more visually oriented ad space. A newspaper is printed on thin paper made from a combination of recycled matter and wood pulp, and is not intended to last very long. Large printing presses, usually located at a plant separate from the editorial and advertising headquarters, print the editions, and a network of delivery trucks bring them to the newsstands and geographical distribution centers for subscribers. Public officials in ancient Rome posted news of the day in a public space, but it was not until the invention of the printing press in the late Middle Ages that mass-produced printed matter became possible. One hundred fifty years after the invention of printing from movable type by Johann Gutenberg in 1447, the first regular newspaper, Avisa Relation oder Zeitung, appeared in Germany in the early 17th century. The first English-language newspaper, the Weekly Newes, began publishing in England in 1622. Over the next few generations, small pamphlets and broadsheets were the primary source of printed information in both England and the colonies of North America, although they were generally geared toward business matters. One of the first newspapers in the U.S. was Publick Occurrences Both Foreign and Domestick, which began appearing in Boston in 1690. These early prototypes of the newspaper eventually developed into publications that appeared on a more regular basis in localized geographic areas. At the time of the American Revolution, 35 newspapers were published in the 13 colonies. Many of these papers and their successors over the next few generations were concerned with political issues of the day and were rather expensive. This changed during the 1830s, however, when technology and publicity popularized "penny papers." The New York Sun was one of the first of these to gain widespread readership. The development of quicker, more efficient printing methods led to a rapid growth of newspapers in the U.S. during the 19th century. As the country expanded and new metropolitan centers sprang up, so did newspapers that served the interests of the region. A growing literacy rate among the populace also helped make such printed matter more popular and profitable. In the latter decades of the 20th century, papers such as the New York Times and the Wall Street Journal have become esteemed sources of news in the U.S. and have wide distribution outside of the cities where they are produced. Until the 1980s, many cities had more than one newspaper, and it was not uncommon for a large city to have three or four competing dailies. By the 1990s, many papers had disappeared or merged so that only one or two noncompeting papers coexisted in major cities. Smaller regional newspapers provide a mix of local news with national and international items. Such papers usually have correspondents in New York, Washington, D.C., and the major cities of the world. Tabloid newspapers, presenting more sensational news and features such as detailed crime stories, first appeared in the U.S. in the 1920s. The word tabloid refers to the size of the printed page, which is generally half the size of a standard newspaper. The process of producing a daily edition of a large city newspaper begins with a meeting of the paper's editors, who determine the amount of editorial copy in an issue based on the advertising space that has already been sold. A specific number of pages is agreed upon, and the editorial assignments are made to the various departments. The section of national and international news, generally the first part of the paper, is compiled from correspondents who send in their stories electronically, usually via computer modern, to their editor's computer. There, the editor checks the stories, sometimes rewriting them or increasing or decreasing their length. Additional stories of importance are compiled from wire services such as United Press International, Associated Press, and Reuters. These are organizations that employ reporters in various cities of the globe to compile stories and items quickly for dissemination over telephone wires. 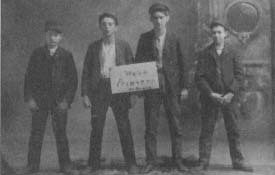 Holding a sign stating "We're Printers, by gravy," these young men had their photograph taken in the mid-1890s, possibly to commemorate the end of their apprenticeships. Timeliness is of the essence in the newspaper business. Even 150 years ago, New York City publishers would have messengers waiting to meet ships coming from Europe. The messengers would grab the latest dispatches, newspapers, and even novels and race to the printing office. There, rows of compositors would be poised to work all night setting type so that the next afternoon's newspaper could contain European news only two weeks old or the first chapters of a novel published months ago. With the coming of the telegraph to the western parts of the U.S. in the mid-19th century, editors commonly kept one or two compositors late into the night ready to set stories that came in from the East by telegraph. The dots and dashes of the telegraph message, often consisting of just key words and phrases, were hastily transcribed by the telegrapher and given directly to the typesetters. Compositors were skilled enough to decipher the telegrapher's scribbles, compose full sentences while setting type (letter by letter) by hand, and complete the entire story by deadline. The Linotype machine, developed in the 1880s, combined the processes of composing text, casting type, and redistributing the type molds. By working a keyboard, the Linotype operator assembled molds, or matrices, of letters, numbers, or punctuation marks in sequence. The matrices were then mechanically held in place while molten type metal was forced into them, creating a line of type ("lin' o' type"). The individual matrices were automatically replaced in the machine's magazine for reuse. The Linotype increased the speed of a typesetter fourfold. This allowed editors to cut labor costs while getting all the latest news. The machine cost hundreds of compositors their jobs and added to the intensity and pace of the work. For a typical, newsbreaking story of local origin, the process begins with a correspondent submitting a report, either in person or via computer modern, to the "rewrite" desk person. The rewrite journalist fine-tunes the wording of the story and makes sure it answers the six important questions: who, what, where, when, why, and how. He or she then sends it over to the computer at the city desk. The city desk editor, who is responsible for the paper's local content, looks over the story, makes additional changes if necessary, and sends it over to the news desk. The news editor, who makes the final call about which stories to run in the upcoming edition based on their relevance, may make further changes before submitting the piece to the copydesk. The story arrives there with guidelines for length as well as headline instructions regarding size and type. From this point, the story is set to be inserted on a certain page that has already been roughly laid out by both the news editor and a makeup editor. A mock-up of the page, essentially a blank form showing where the stories will run and where pictures and advertising will be inserted, is called the "dummy." The makeup editor has already met with the advertising department to determine how such pages will be laid out with ad space. The dummy has rough notes for headlines, story insertions, and graphic elements such as photos and tables of statistics. It also shows the date of the edition as well as a page and section number. After the news editor has determined the placement of the story on the page in question—as well as the other items set to run there—the dummy is sent on to a composing room. 1 The composing room receives the story in an electronic format, with the computer text file already translated with typeset codes. In a typeset file, the characters are of the same "type"—style, size, and width—as they appear on the pages of the newspaper. The setting of stories into the type that a reader sees went unchanged for several decades until the latter years of the 20th century. Well into the 1800s, type was set by hand, letter by letter. A typesetter dropped small metal letters into a hand-held tray called a "stick." The invention of the Linotype machine in 1884 made possible a quicker, more efficient method of typesetting. Invented by German immigrant Ottmar Mergenthaler of Baltimore, Maryland, this large, cumbersome machine worked by casting hot lead into a line of type with the assistance of an operator who typed in the copy on a keyboard. Individual lines of type were then placed by hand onto a page form. When a page was completed, it was then sent to a stereotyping room where a curved metal plate was made from the page form. 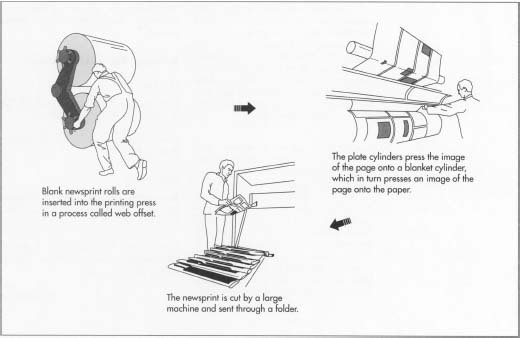 The page form was then placed on the printing press. Modern technology has replaced the Linotype process through a method called phototypesetting. The first step in this process is the transfer of the dummy to the page layout section of the newspaper. There, an operator transfers the instructions on the dummy into a rough page prototype. A printed version may be looked over and adjusted several times by one of the reporters whose story is featured as well as by the copy editor. If another breaking story comes in, this page layout can be altered in a matter of minutes. 2 The final version of the page is then approved by the editor on duty—sometimes a night editor in the case of a paper that is slated for a morning edition—and sent over to a process department. 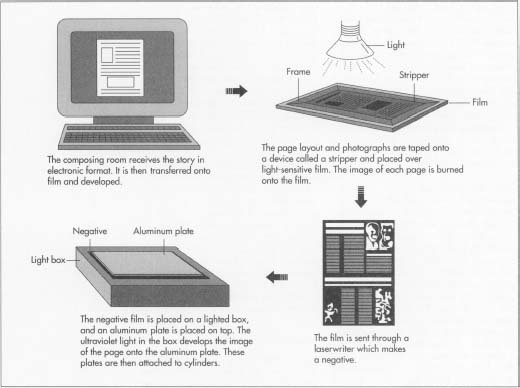 There, the page is taken in its computer format and transferred via laser beams onto film in an image setter apparatus. The operator then takes the film to a processor in another section of the paper, who develops it and adjusts it for its final look. Photographs are scanned into another computer terminal and inserted into the page layout. The pages that are set to be printed together are then taped down onto a device called a "stripper," and an editor checks them over once more for errors. The strippers are then put into frames on light-sensitive film, and the image of each page is burned onto the film. The film of each page is inserted into a laser reader, a large facsimile machine that scans the page and digitally transfers the images to the printing center of the newspaper. citywide distribution, the pages arrive at the laser room and are put through a laser writer, another scanning device that makes a negative image of them. In the negative image of the page, the text is white while the blank spaces are black. The final images of each page are further adjusted. This last-minute adjustment may involve fine-tuning of the colored sections and retouching photographs. 3 From these negatives, the forms from which the paper will be printed are composed in a platemaking room. The film of the page, usually done two pages at a time, is then placed on a lighted box. Next, an aluminum plate containing a light-sensitive coating is placed on top of the image of the pages. The light box is then switched on, and ultraviolet light develops the image of the pages onto the aluminum plate. The aluminum plate is then bent at the edges so that it will fit into a press, and is fitted onto plate cylinders. stand, which has three components: the first reel brings a roll of paper up to the press, a second is loaded and ready to replace the first roll when it runs out, and a third reel stays empty and ready to be fed with another when the first reel is almost finished. Each roll of blank newsprint has double-sided tape at its edges, so that when one roll runs out in the press, another smoothly takes up where the other left off without interrupting the printing process. The plate cylinders then press the image of the page onto a blanket cylinder, leaving a version of the page's image on the cylinder's soft material. When the paper runs through the press, the blanket cylinder presses the image onto it. The chemical reaction of the ink, which contains oil, and the squirting of jets of water into the process result in the actual newspaper page of black or colored images on a white back-ground. Since oil and water do not mix, the areas where ink should adhere to the page are black or colored, and water washes away the parts where ink is not needed. This is why this printing process is referred to as "offset." Next, the large sheets of printed newsprint move on to another large piece of machinery called a folder. There, the pages are cut individually and folded in order. This entire printing process can move as fast as 60,000 copies per hour. Quality control technicians and supervisors take random copies and scan them for printing malfunctions in color, order, and readability. Next, a conveyer belt moves the papers into a mail room section of the plant, where they are stacked into quires, or bundles of 24. The quires then move to another section where a machine wraps them in plastic. The bundles are now ready to be loaded onto delivery trucks for distribution. The demise of the printed word, especially in the form of a daily newspaper, is periodically predicted to be imminent by industry analysts. The growth of other news sources —such as radio and 24-hour television news stations—has helped diminish the impact of newspapers, but the competition between dailies in many cities has forced many of the weaker, less financially-viable newspapers out of business. In many cities, joint-operating agreements—by which two competing papers share business, advertising, and printing departments—has helped to keep two editorially distinct papers afloat. Bypassing the printed newspaper altogether, on-line computer technology has enabled consumers to pick and choose news from among their own specific interests on the information superhighway. One site on the Internet, one of the most popular providers of access to on-line information, allows a person to create his or her own newspaper. A menu appears onscreen, and the user selects stories from wire services, as well as entertainment features and cartoons, and inserts them onto a template. This template can be generated on a daily basis with a few keystrokes, producing an edition of a customized newspaper almost instantly. Miller, Margaret. Hot Off the Press! A Day at the Daily News. Crown, 1985. Waters, Sarah. How Newspapers Are Made. Facts on File, 1989. Booker, Ellis. "Extra! Extra! Newspapers Paperless." Computerworld, July 20, 1992, p. 30. Kowet, Don. "Laying Out a Futuristic Newspaper." Insight on the News, May 14, 1990, p. 48. Good morning,my question is in line with my project topic. The topic is: the effects of pictures and images in our national dailies in the generation of meanin;using some selected newspaper in Nigeria. Please,I need materials on this research topic,thanks in anticipation.